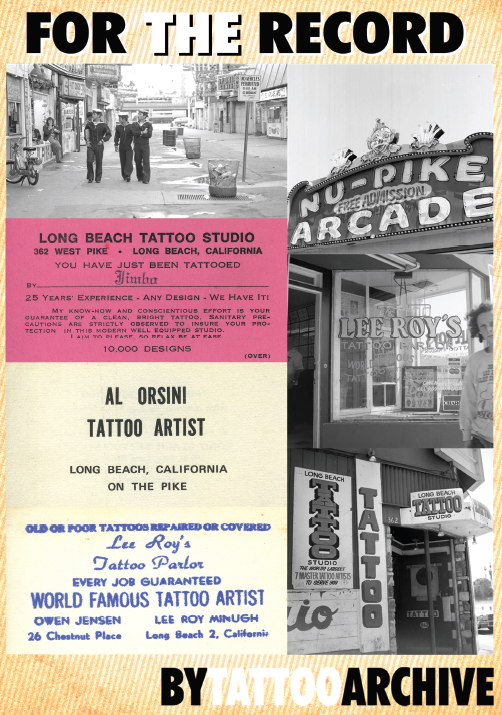 Courtesy of Tattoo Archive: The Pike, often known as the “Coney Island of the West”, was a large amusement park located on the waterfront in Long Beach, California. It all started with a pier that was built in 1893 that grew into a major amusement area. It is unknown when or where the first tattooist set-up shop at the Pike, but it was probably in the corner of one of those small arcades that lined the, “Walk of a Thousand Lights...” Over the years hundreds of tattooists worked at numerous locations at this waterfront amusement center. I would like to thank Southern California photographer Ben Serar for the use of his great black and white photographs for this article. Ben Serar started taking photos of the Pike around 1976 and continued through it’s destruction. His photographs are part of a documentary photo project for one of his classes at Cal State Long Beach. In 1978 Serar shot a 16 mm black and white film on the Pike, which he donated to the Long Beach Historical Society. Ben Serar said, “he thought the Pike was cool, the way it turned from what it was into this kind of creepy but romantic place.” Following is a bit of background history, including business cards of the shop fronts seen in this article. Lee Roy’s Tattoo Parlor, World Famous Tattoo Artist, Owen Jensen & Lee Roy Minugh, #26 Chestnut Way Chestnut Way was arguably the most popular street for tattooing at the Pike; Lee Roy’s shop was located just down the block from Bert Grimm’s location. When Eric Minugh, Lee Roy’s son looked at this photograph he commented that this was one of the windows that was broken several times during the Grimm/Jensen/Minugh feud in the 1960 and 70s. Minugh open this shop around 1957 and tattooed there until 1977 when he retired. Before moving to this location Lee Roy tattooed at the other end of the Pike at an unknown address. Eric Minugh also said that “Duffy”, L.W. Duff, had this location before his father moved in. Fred Thornton also worked in this shop, probably with Duffy. Long Beach Tattoo Studio, The World’s Largest, 7 Master Tattoo Artists to Serve You, #362 West Pike At one time Capt. Jim Malonson, Al Orsini & Fred Thornton, owned this shop. Jim “Jimbo” LaPorte was also one of the many part owners in this shop -- it seemed to be a kind of a co-op. In an interview Jimbo said that when he went to work there he was working for Capt. Jim, and Phil Sims worked for Orsini, they held down the night shift while Thornton worked the day shift by himself. Jimbo said that “this shop was a bar in an earlier life” and they never had anything to do with Lee Roy and to my lasting regret, Owen Jensen who worked nights there.” In later years Capt. Jim built the 7 Seas shop across from the Long Beach Tattoo Studio on the opposite corner of the Pike. This piece of land is where the old Himalaya ride used to be, Jim bought the property and started construction when the lease at the Long Beach Tattoo Studio was running out. From the May 18, 1979 Independent Press-Telegram: “The Long Beach Nu-Pike, a Southern California fun mecca for more than six decades, died suddenly Thursday without a last laugh. The one-time carnival zone, in failing health for years due to an absence of customers, expired quietly as victim of progress and the gas shortage.” As fate would have it one tattoo shop survived the destruction of the Pike, Bert Grimm’s #22 Chestnut Way shop is still open thanks to the hard work of Kari Barba. Tattoo Archive © 2010 ................................................................................................... This installment of For the Record was featured in Tattoo Artist Magazine issue #23.